Hidden New Jersey: Amphibian warfare in Hopewell? While I was researching after my recent Hopewell trip, I discovered that the mascot of the town's elementary school is Freddy the Frog. Okay, that's fine; maybe at some point the kids got really charged up about amphibians and petitioned the principal to officially designate the frog as their patron animal. Nice thought, but untrue. Believe it or not, the name originates from a battle: the Frog War. 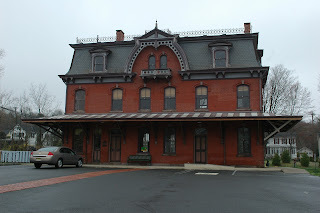 The historic Hopewell train station, no frogs in sight. Small green animals with guns and grenades? Nope. It's about trains. Back in the mid 1800s, railroads were expanding in New Jersey, which isn't surprising given the state's historic importance as a critical transportation corridor. 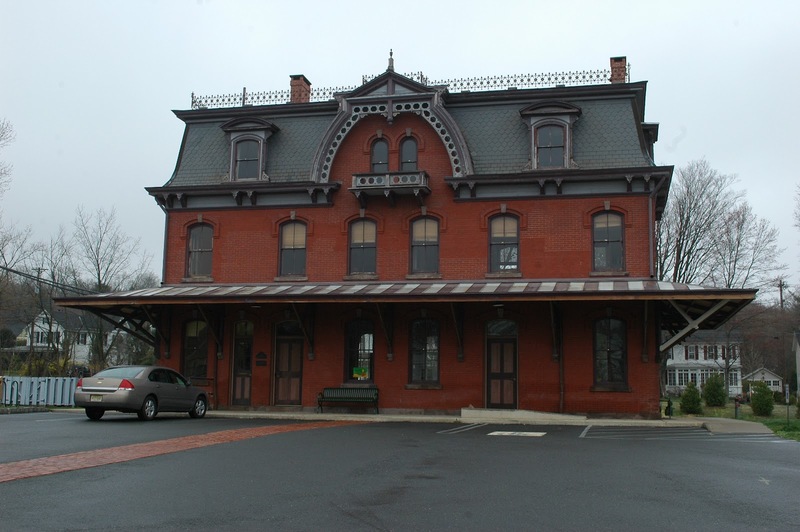 The Pennsylvania Railroad had a choke-hold on the state, but that didn't stop a group of entrepreneurs from forming New Jersey's first separately owned railroad, the Delaware and Bound Brook. State legislation had opened the industry to competition in 1873, and the D&BB was itching to get into the business. As major corporations will, the Pennsy Railroad responded by creating a separate subsidiary to compete with the upstart. The Mercer and Somerset Railroad was designed primarily to block the D&BB by intersecting its path with a common crossing at a point northwest of Hopewell. In railroad parlance, the intersection they used is called a frog. See how the amphibians get involved? The D&BB, to its credit, didn't simply concede its right of way to the larger Pennsy system. With the country's centennial approaching, the route to Philadelphia was far too lucrative and the upstarts wanted their share of the potential profits. They kept laying rails on their planned path, no doubt expecting a confrontation. Meanwhile, the Pennsylvania railroad stationed a locomotive at the disputed stretch of track, yielding the section only for its own oncoming traffic. This simmering dispute was bound to heat up, and it did in January 1876. As the blocking locomotive moved to let an approaching Pennsylvania train through, a mass of D&BB laborers jumped out of the brush to block the engine with heavy ties. A D&BB locomotive then chugged up to further assert the young railroad's right of way. Hostilities grew when the Pennsy railroad sent their own host of men to defend its perceived right. The situation got so heated that the governor sent a militia at the request of the Mercer County sheriff. It wasn't unusual for corporations of the day to use muscle to quash competition, but the great Frog War was ultimately settled in a more modern venue: the courts. With the law and popular opinion on their side, the little guys won, and D&BB finished its route while the Pennsy disbanded the M&S. Today the track is still in use as part of Conrail's Trenton freight line, and local explorers routinely go on a search for the frog in contention. Any of you Hidden New Jersey readers ever find it?